There are lots of reward credit cards that allow cardholders to earn valuable points, miles, and cash back. Yet most of the products come with an annual fee that can start at around $50 and go up to several hundreds of dollars per year. But what if you are trying to maximize your credit card rewards while refusing to pay an annual fee? American Express offers its Blue Sky card while Capital One features its VentureOne rewards card, each with no annual fee and competitive rewards. Let’s compare these cards side by side and see which one is the better value, keeping in mind that those who use reward cards should always pay their balance in full each month. Otherwise, cardholders are best off using a non-rewards card with a lower interest rate. VentureOne cardholders earn 1.25 miles for each dollar spent on all purchases. Capital One miles are worth one cent each as statement credits toward any travel related expense. In addition, new cardholders start off with a 10,000 mile sign up bonus, worth $100, after spending just $1,000 within three months of opening an account. This card also comes with an attractive promotional financing offer. New cardholders receive 12 months of 0% APR financing on new purchases. There is no annual fee for this card, and no foreign transaction fees. The standard interest rate is 11.9% – 19.9%, depending on the applicant’s credit worthiness. That said, those who sign up for reward cards such as this should be paying their balance in full every month. Otherwise, cardholders are better off using a credit card that doesn’t earn rewards, but has a lower interest rate. Insider tip:Â Capital One offers a similar card called the Venture Rewards card. That card offers two miles per dollar spent, but has a $59 annual fee. Therefore, those who would spend more than $8,000 a year on this card would earn more rewards by using the card with the annual fee. American Express Blue Sky offers cardholders one reward point per dollar spent on all purchases. And for some reason, cardholders need to accumulate 7,500 points to redeem them for a statement credit of $100 toward travel expenses. Therefore reward points are worth a healthy 1.33 cents each. In addition, new cardholders earn 7,500 points, worth $100, when they make $1,000 worth of transactions within three months of opening a new account. New cardmembers also receive a 0% APR introductory rate on new purchases that is valid for 12 months. After that, this card has a variable rate that is currently 17.24, 20.24 or 22.24%, based on your creditworthiness. 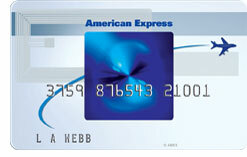 American Express cards are known for their perks and benefits and this card does not disappoint. There is a 24/7 global assist hotline to help with issues when traveling, as well as car rental and damage insurance, and travel accident insurance. In addition, cardholders receive a roadside assistance dispatch service, although they are responsible for payment. Finally, cardholders receive Entertainment Access emails that offer exclusive access to shows, concerts, and sporting events. There is no annual fee for this card, but there is a 2.7% foreign transaction fee imposed on all charges processed outside of the United States. Capital One has a great product here, but American Express edges it out primarily because the American Express Blue SkyÂ offers 1.33 cents in value per each dollar spent versus only 1.25 from Capital One VentureOne. The American Express card’s benefits are also slightly better. Otherwise the cards are pretty evenly matched with no annual fee and a $100 sign up bonus. Those who travel outside the United States would be best off using any Capital One card during their trip, just to avoid foreign transaction fees. Both of these cards offer competitive rewards with no annual fee, and it is up to applicants to choose the one that will return the most rewards. And for most credit card users, American Express Blue Sky will come out ahead. At one point, I was in the position to choose one from these two cards. I could not see how capital one can compare to the long and strong reputation that AMEX had. I did some research only to prove that AMEX was superior. More respected name. Don’t people get better rewards for their dollar by getting the Capital One Cash Rewards w/ no annual fee? This 1.5% effective cash back rewards beats both the 1.25% and 1.33% respectively. Just because these cards are advertised as “travel” cards doen’t mean they would be better served by something else.